What is the best document management solution for you and your business, One Drive for Business or SharePoint? In this blog post we assess whether and how they should be used as a DMS for a growing company. 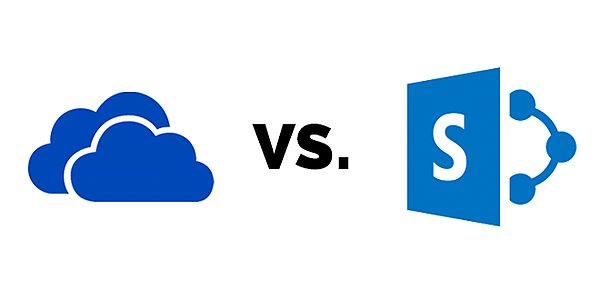 OneDrive for Business Vs SharePoint; what is the difference? OneDrive for Business (ODfB) and SharePoint (SP) are both components of Office 365, incorporating shared architecture and features that allow businesses to store and manage their documents in different ways for different reasons. ODfB is a basic tool for remote working and collaboration, whereas SharePoint offers more sophisticated functionality, allowing businesses (with time and specialist support) to build out and maintain more formal Document Management Systems of their own. With the ubiquity of Microsoft software in the modern office it might seem an obvious next step to try and manage all your businesses documentation using one or both of these enterprise products. But are they up to the job? Is OneDrive for Business a Document Management System? OneDrive for Business is a cloud-based solution that is designed to help businesses collaborate, share and store files more easily and on the move. It allows access to shared MS Office files from multiple locations via desktop and mobile applications, ensuring data is not lost or overwritten. Administrators and users can restrict and control access to content within teams and organisations, choosing who can make changes and contribute to documents and who can’t. In addition, the system can share real-time notifications with selected individuals whenever a file is viewed or edited. If there is a conflict between file versions, when they have both been worked on at the same time, users can decide if they want to merge, change, or keep both copies of the document. There is also limited auditing facilities, too, so that you can track who has made changes and when. For staff and business, the mobility and flexibility of the solution is clearly a huge benefit. The opportunity to work on documents from anywhere at any time fits well with modern working patterns. At the same time, the ability to share files instantly, with selected clients and external collaborators obviously makes for more efficient, agile working. For cash strapped high-tech startups already paying for licenses for Office 365, you might well wonder if they can help you collaborate on and manage the documentation necessary to see a product through from ideation and design to build and launch. What is possible with OneDrive? First of all, you need to consider the ability of the system to really ‘control’ documentation in the way you need when embarking on a complex project with multiple contributors and dependencies. OneDrive for Business only gives each user 1TB of storage. However, depending on which plan you have selected, it is possible to pay for more. But will that be sufficient for the long term storage of the proliferating technical and regulatory documentation you can expect to generate? More importantly, you need to consider whether the processes and protocols in OneDrive reflect the controls required by any regulatory bodies you will need to deal with later on. A medical device developer, for example, will need to meet the stringent Quality requirements of ISO 13485. Will OneDrive for Business make your Quality documentation accessible in the way a certifying body might require? Can a clear audit trail for every file be established, can all the quality documentation you generate within it be subject to automatic and regular review? How are the proactive values of ‘risk based thinking’ required by ISO reflected in the structure and operation of the solution? Can development projects be phase gated so approvals can be gathered before documents are released for the next stage of a build? Can final versions of documents be ‘locked down’ for editing to ensure they are not subject to unauthorised change? To be fair, even Microsoft is not suggesting that OneDrive for Business is the right tool for the most complex file sharing document control scenarios. For more stringent and bespoke requirements they will point you in the direction of SharePoint. So is SharePoint the answer for SME’s wanting to create a Document Management System? The simple answer is - yes, it can be - but at a cost. SharePoint does offer a single record management system for storing and sharing company files. But, you will most likely need a consultant to come and install it and it won’t be an overnight process to get it up and running. Many of the advanced features required of a robust Document Management System can be built into a SharePoint solution. You can create repositories for Quality Documentation that are lockable and can be properly audited. Digital signatures and a variety of other features can be integrated into workflows. You can build out features that answer many of the quality requirements that ISO demand, but you will need to select and implement those solutions for yourself. When configuration becomes this complex and bespoke it starts to become something more like development. And surely your time and resource could be better spent in developing products to sell rather than building bespoke platforms for document management? With a SharePoint development project there are many costs from the consultation required to capture requirements and set up the solution, to the yearly licencing fees and ongoing maintenance that mean you can manage upgrades and customer service. Have you got the personnel available to act as your SharePoint Administrator? Do they have the right skills for the job? They should be familiar with Windows Server, IIS management, C# development practices, Active Directory, and, of course, the SharePoint platform itself. As they say, SharePoint makes it necessary for IT departments to exist. When you are considering Document Management Systems for a growing business it’s tempting to select easy solutions that ‘come with’ familiar software. In the case of Microsofts OneDrive for Business it promises easy collaboration and storage, but it’s not robust enough to double as a Quality Management System (QMS). SharePoint, on the other hand, has much of the functionality you would need to work as a file sharing and QMS solution but takes huge amounts of time, expertise and resource to configure and maintain. Fortunately, there is an alternative. Proprietary software solutions, developed with growing businesses in mind can help you build out robust Document Management Systems quickly and easily. These operate as secure ‘digital frameworks’ in which you can store Quality and other documentation, all subject to the highest standard of version control. These are Document Management Solutions which are robust enough to meet the Quality Management standards of ISO and other bodies, while lightweight enough to scale to your needs. They offer secure environments for multi-agency collaboration and integrate with a range of different design and development software tools to help you maximise productivity. Easy to operate, quick to configure, powerful and robust - they are an ‘out of the box’ solution for businesses that are looking to grow rapidly, but in an agile way.